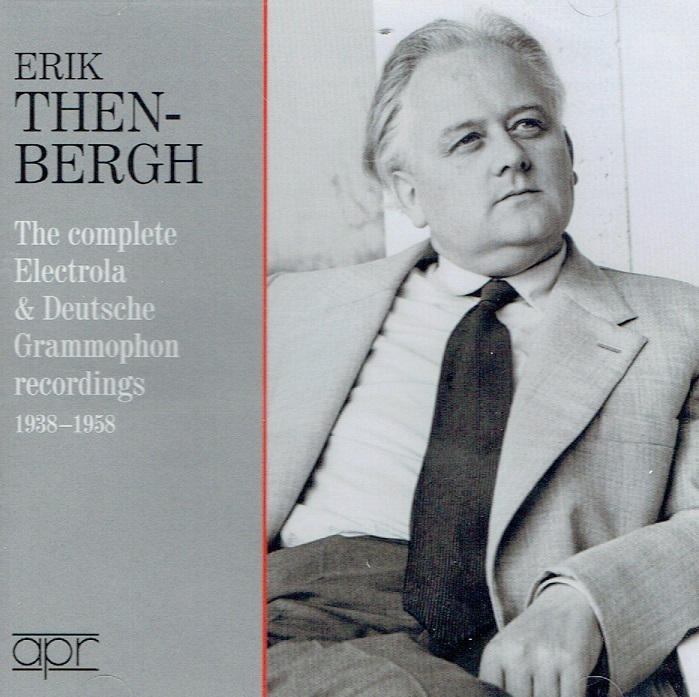 “This year marks the centenary of the birth of the German pianist Erik Then-Bergh, and this release of his complete Electrola and DGG recordings by APR is both a fitting and welcome tribute. I say complete, unfortunately his 1942 Telefunken Schumann KINDERSZENEN has been omitted due to lack of space. Nevertheless, this 2 CD set has added value in that there’s not much of the pianist’s recorded legacy available. Then-Bergh was something of a homebird, generally confining his career to Germany and devoting the last twenty years of it mainly to teaching. This goes some way towards explaining his relative neglect. As a pedagogue he was much sought-after for his inspirational guidance and analytical skills. The booklet contains some interesting reflections by his one-time student Elizabeth Hopkins. Central to his repertoire were the German composers – Beethoven, Schumann and Brahms, and he made something of a name for himself playing the music of Max Reger. This compilation offers two examples: the Variations and Fugue on a Theme of Georg Philipp Telemann Op.134, and the Piano Concerto in f minor Op.114, his final recording from the LP era. He was born in Hannover in 1916, and his father was his first teacher. He became a protégé of Clara Spitta and gave his first piano recital at the age of thirteen. He continued his studies with Alfred Hoehn at the Hoch Conservatory in Frankfurt, and later sought guidance in Berlin. His career as a concert pianist and recording artist took off around 1936, winning various prizes along the way. His concert-giving continued during the war on the back of the National Music Prize in Berlin, clinched in 1940. After the briefest of spells in military service he was considered exempt, as he was one of a handful of artists considered by the Third Reich ‘indispensable’. After the war he held several teaching posts in Germany. He died in 1982, aged, 65, from an unexpected heart-attack. The commercial recordings here span twenty years. The earliest 78s were set down in 1938, and for his début disc Then-Bergh chose the Busoni transcription of the monumental Chaconne from Bach’s Partita #2 in d minor for solo violin, BWV1004. 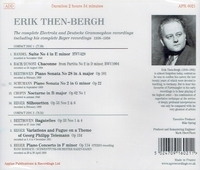 The last recording is the Reger Piano Concerto made for LP, in stereo, in April 1958. In the Handel Suite, shorn of its repeats, Then-Bergh adroitly displays his contrapuntal skills and achieves some organ-like sonorities, aided by generous octave doublings in the bass. In Then-Bergh’s hands the Chaconne is a monumental edifice of great nobility. Throughout, tension and drama are sustained, yet there are sublime moments of reflection and serenity. Chopin is not a composer who features prominently in the pianist’s discography. It’s a pity as the Nocturne in B major is expressively rendered and etched with poetic lyricism. Apart from this Nocturne, there is only a later inscription of Op.9, #2. In concert, however, he programmed the Piano Concerto in f minor, the Polonaise-Fantasie, Preludes and the Second Sonata. In February 1939 the pianist set down his interpretations of Beethoven’s Piano Sonata #28 in A major Op.101 and the two delightful Reger ‘Silhouetten’, pieces I’ve never come across before. Beethoven features prominently in his discography, and he recorded eight more of the sonatas after the war. Two of the composer’s Bagatelles from 1942 are included here. The performance of Op.101 captures not only the intimacy and introspection of this late work, but also its freedom and fantasy. The dotted rhythms of the second movement are crisp and buoyant. The Adagio has a probing intensity, and in the finale the polyphonic strands of the fugue are meticulously defined. In September of 1939 Then-Bergh took Schumann’s Second Piano Sonata into the studio. He contours the ebb and flow of the work to perfection. The performance encapsulates the exultant passion and drama of the music, yet there are moments of ardent tenderness. In the Reger Piano Concerto’s formidable technical demands, Then-Bergh steps up to the mark admirably. His aristocratic pianism and varied tonal palette are particularly compelling in the ‘Largo con gran espressione’, the Concerto’s most appealing movement. I love the way he evokes its dreamy, pensive character, relishing the music’s lyricism. In the outer movements there’s sufficient drama and passion, with some Germanic humour in the finale thrown in for good measure. Hans Rosbaud is an inspirational conductor, securing favourable results from the Baden-Baden players. The ‘Variations and Fugue on a Theme of Georg Philipp Telemann’ Op.134 was recorded in December 1951. In the performance the pianist omits variation 21; apparently he found it ‘boring’. It’s an interesting piece, with lavish helpings of Lisztian bravura. Then-Bergh’s impressive dexterity, range of colour and imaginative flair are a constant wonder. 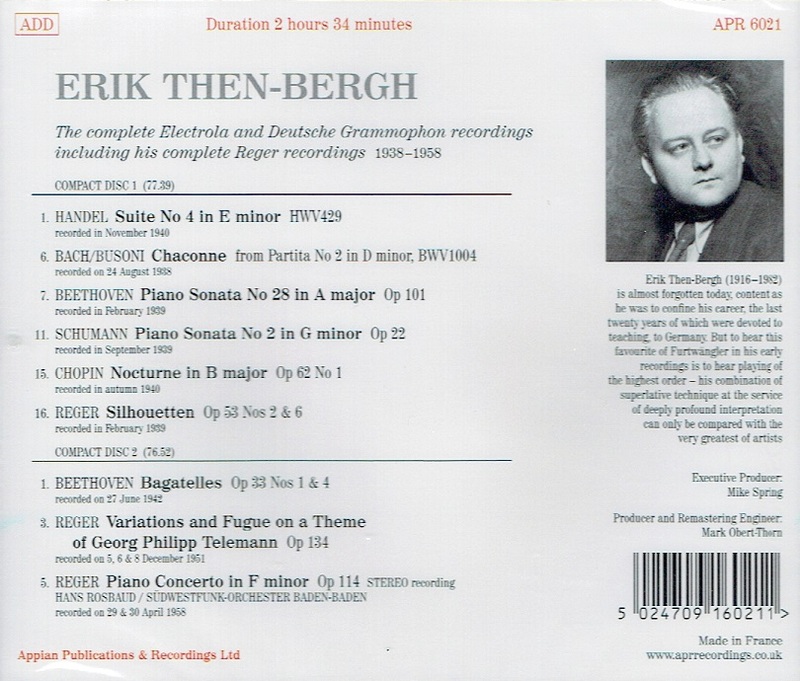 'The performance by a pianist of whom we know nothing, Erik Then-Bergh, is spectacularly fine, and is backed by some of the best reproduction of piano tone we have ever heard'."